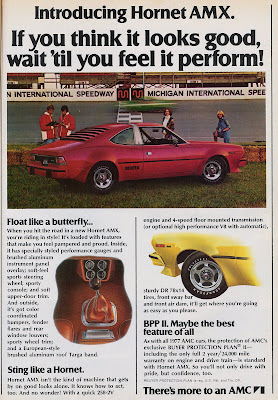 Don't misunderstand, AMC and the 258 ci straight six have earned a special place here and the Hornet is fine automobile. However this is the most confused advertisement I've ever seen. So what's going on here. First, they've taken the Hornet to the race track which BB fully endorses. Maybe MIS isn't our first choice to but this is the namesake to the Fabulous Hudson Hornet of stock car fame. So the ad tells us we're at a race track to feel it perform and then veers straight into riding in pampered and proud style. The Hornet has been given the AMX treatment by adding a sporty console, soft-upper door trim, color matched window mullet, and brushed aluminum roof Targa band. Not exactly AMX material.